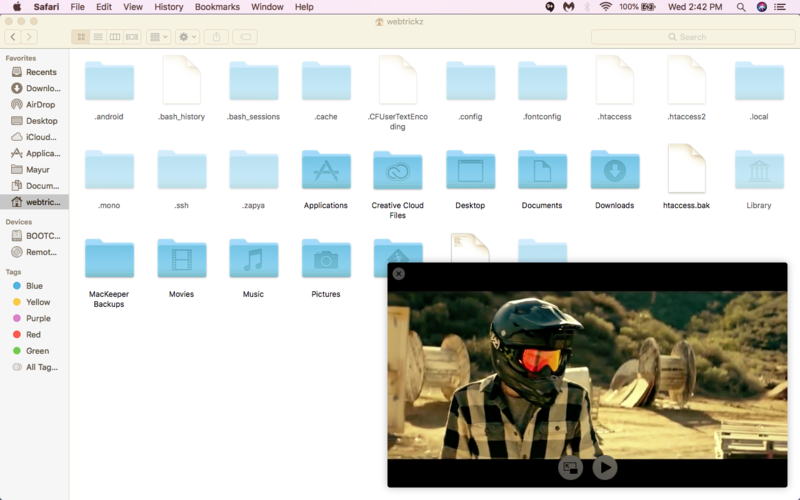 The Picture in Picture aka PIP mode was introduced with macOS Sierra that offers the ability to play video in a resizable window on your Mac. Videos opened in PIP mode float above all the active windows and lets you watch them, while you continue to browse the web or get the work done at your workplace. PIP is a nifty feature that many Mac users aren’t aware of. 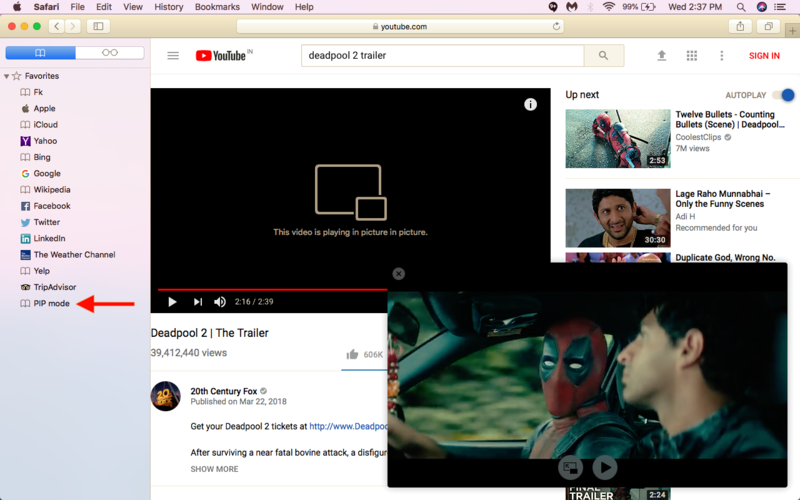 The picture-in-picture currently works with iTunes and Safari for video streaming sites that use HTML5 such as YouTube and Vimeo. Vimeo explicitly supports the PIP mode and has a PIP icon integrated into its video playback controls for quick switching. YouTube, on the other hand, does support PIP but doesn’t offer a dedicated button to directly open a video in Picture-in-picture. Perhaps, the only way to open a YouTube video in PIP on Safari for Mac (as listed on most websites) is by using the hidden option. The said option requires right-clicking a YouTube video twice to enter the PIP mode, however, it isn’t the best and most feasible way. To make it easier, users can rather use a bookmarklet to toggle on the PIP mode on Safari browser for Mac. This method works for most video streaming sites including YouTube, Vimeo, Amazon Video, Hulu, Netflix, Twitch, Vevo, Metacafe, and DailyMotion. To open a video in PIP, simply click the PIP bookmarklet in Safari. The video will pop-out and open up in a floating window that sits above all the windows. Hence, you can view it while you’re on the desktop, using Chrome or running an application on your Mac. The floating window sits in the bottom right corner by default but you can move it to the desired position and can even resize it. There are only a few controls that one can access in PIP such as Play/Pause and exit PIP window, that opens the video in its actual tab on Safari. As you might have noticed, there is no seek bar in PIP window so can’t forward or rewind a video. It’s worth noting that the related tab in Safari must remain open to watch an online video in PIP mode. If you don’t wish to use the above bookmarklet, then you can rather install “PiPer” extension for Safari. 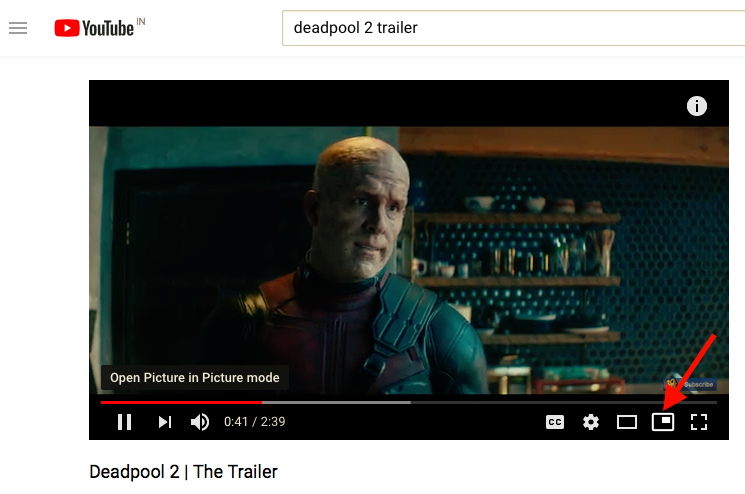 This extension seamlessly adds a dedicated Picture in Picture button to the video player of supported sites such as YouTube, Netflix, Amazon Video, Twitch, and more. It’s free and also supports closed captions in PIP mode. To use PiPer, install it and reopen Safari for the changes to take effect.